Welcome back to my look back on The Terminator franchise, where I’ll cover the last two (as of writing) Terminator films in the franchise. After the runaway success of Terminator 2: Judgment Day, everyone thought that would be the end of the series. But it seems those darn terminators were not done yet and would rise once again. Terminator 3: Rise of the Machines: Coming hot off the heels after Terminator 2: Judgment Day, Terminator 3: Rise of the Machines was released just 12 years after the previous film in 2003. But this time, gone are James Cameron and Linda Hamilton with only Arnold Schwarzenegger returning. Written by John Brancato and Michael Ferris, directed by Jonathan Mostow. Now living off the grid, John Connor has lost his mother to leukemia. Judgment Day did not occur on August 29 1997 as the events of Terminator 2: Judgment Day prevented it. However, John still believes that war between humans and the machines could still come about. Unable to locate John in the past, Skynet sends a new more advanced model of terminator back to 2004 called the T-X. The T-X is programmed to hunt down and kill other members of the human resistance lead by John Connor in the future. The T-X has an endoskeleton with built-in weaponry, a liquid metal exterior similar to the T-1000, and the ability to reprogram other machines. Also of note, this is the first terminator that utilizes a female appearance. As in T2, the resistance send back a reprogrammed and this time upgraded T-800 in the form of a T-850 terminator that is programmed to protect the T-X’s targets including John’s future wife and second-in-command in the future resistance, Kate Brewster. 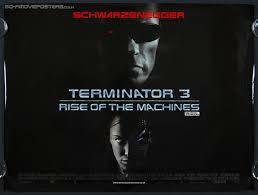 With a budget of $187.3 million, Terminator 3: Rise of the Machines was not only the most expensive film in the franchise so far but also the most expensive film ever made at the time. 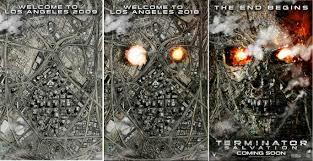 T3 would also go on to be Arnold Schwarzenegger’s final starring role before his becoming Governor of California until his 2013 film The Last Stand 10 years later. Linda Hamilton was asked to reprise her role as Sarah Connor for this film but turned the offer down. Linda said after reading the script and finding her character was to be killed off before halfway through the film, she felt Sarah had become “disposable”. James Cameron even tried to get his own T3 project off the ground in the mid 90’s but never finished a script. Then Terminator 2: Judgment Day developer Carolco Pictures went bankrupt. Assets included 50% of the Terminator franchise rights, as the other 50% remained with the producer of the original Terminator, Gale Anne Hurd. James Cameron and 20th Century Fox had some interest in making T3, even arranging meetings with Gale Anne Hurd regarding her share of the franchise and actor Arnold Schwarzenegger to return in the starring role. Eventually budgetary concerns and Cameron’s troubled post-production of Titanic for 20th Century Fox lead them to back out of the plans. Carolco founders Mario Kassar and Andrew G. Vajna purchased the rights to the franchise for $7.5 million, and then later also got Gale Anne Hurd’s half of the franchise to become full owners of the Terminator franchise. They then founded a new company named C2 Pictures which produced T3. Even at the time, it was unsure whether Arnold Schwarzenegger would return as the film had been in development hell for years and Arnold had turned his interests to politics. Plus with James Cameron pulling out of the project, Arnold felt it wrong to return to the character James created without him. Still after talking to James Cameron and taking his advice of accepting “nothing less than $30 million.”, Arnold eventually put his political career on hold to make T3. T3 met with generally positive reviews at the time but just could not beat or even match the praise for the previous installment, T2. Making $433.3 million at the box office worldwide, T3 was considered a success. Three films in and three different production companies. While the films were all successful so far, there seemed to be some kind of trouble following the franchise around as each production company that made a Terminator film eventually went bankrupt. It was even doubtful another film in the franchise would happen…but would there be salvation in the future? Terminator Salvation: The fourth film in the franchise so that means a fourth production company for the film. This time it was The Halcyon Company crack at the whip with the Terminator franchise, with John Brancato and Michael Ferris taking on writing duties and Joseph McGinty “McG” Nichol directing. This time none of the cast from the previous films return not even iconic star Arnold Schwarzenegger…technically speaking. Now set in 2018, almost fourteen years after Judgment Day. John Connor leads the Resistance to attack a Skynet base, where he discovers human prisoners and schematics for a new type of Terminator (the T-800 Model 101). John is the only survivor of the assault on Skynet after the base is destroyed in a nuclear explosion. Later, the Resistance discovers a radio signal believing it to be sending an order to shut down Skynet machines. The Resistance plan to launch an offensive against the Skynet base in San Francisco, in response to an intercepted “kill list” created by Skynet with a plan to kill the Resistance command staff. John learns he is second on the list, following Kyle Reese. The Resistance leaders are unaware of Kyle’s importance, but John knows Kyle will eventually go back in time to 1984 and become his father. Originally convinced to be a fresh start and a new trilogy of films with Terminator Salvation being the starting point of a series set in and around the future war. Terminator Salvation met with below average reviews and critical acclaim, effectively putting an end to the new trilogy concept. Also the fact that the production company, The Halcyon Company filed for bankruptcy in 2009 (that’s four out of four) didn’t help much either. With an estimated budget of around $200 million, but box office returns of only $371.3 million, Terminator Salvation was the most expensive and yet least profitable of the franchise so far. Reviews are average at best but the film became more infamous for Christian Bale’s angry rant at director of photography Shane Hurlbut. Which is probably more well known, thanks to the interwebs than the film itself. Terminator Salvation seemingly buried the Terminator franchise once and for all…or did it? That just about warps up part II of my retrospective look at the Terminator franchise and all the cinematically released films to date. In part III I will take a quick look at upcoming sequel/reboot; Terminator Genisys and offer my own views on the films and franchise so far. This entry was posted in LBoM: Retrospectives and tagged LBoM: Retrospectives, Little bits of gaming, Terminator 3: Rise of the Machines, Terminator Salvation, The Terminator on 19/05/2015 by Steve Perrin.